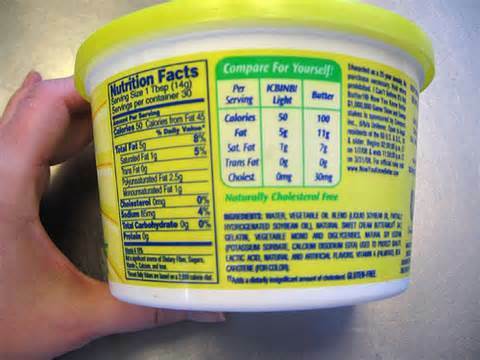 INGREDIENTS: Vegetable Oil Blend (Liquid Soybean Oil and Partially Hydrogenated Soybean Oil), Water, Nonfat Yogurt (Cultured Nonfat Milk), Salt, Gelatin, Vegetable Mono and Diglycerides, Soy Lecithin, (Potassium Sorbate, Calcium Disodium EDTA) used to Protect Quality, Lactic Acid, Artificial Flavor, Vitamin A (Palmitate), Beta Carotene (for Color). Serving Size: 1 TBsp, calories 100, Total Fat 11g (Saturated fat 2g, trans fat 3g), cholesterol 2g, sodium 105 mg. 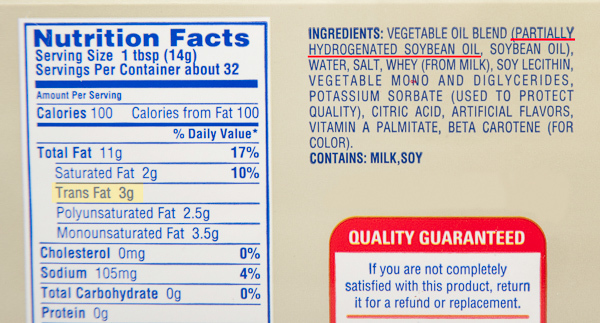 Ingredients: Vegetable oil blend (partially hydrogenated soybean oil, soybean oil), water, salt, whey (from milk), soy lecithin, vegetable mono and diglycerides, potassium sorbate, citric acid, artificial flavors, vitamin A palmitate, beta carotene. When I look at these different options I am looking for a couple things. I want the least amount of ingredients so it is as natural as possible for the least amount of calories. Since I mainly help patients with weight loss I want to recommend a product that allows the taste and feeling of butter, but since regular butter is 100 calories per tablespoon it’s tough to justify using the real thing. After comparing the ingredients and nutrition labels on butter, whipped butter, margarine, light margarine, and a popular yogurt-based margarine, I have come to the conclusion that I would recommend the whipped butter option. It has the same ingredients as butter (cream and salt) but has air whipped into it, making it lighter and less dense. If you can stick with the same tablespoon-size portion, you’ll save half the calories and saturated fat by choosing whipped butter in a tub. The light and yogurt based margarine have slightly less saturated fat and cholesterol with about the same number of calories but not enough of a difference to make up for all those extra ingredients in my opinion. In any case, 50 calories is about the most I would award towards any form of butter on a meal (that’s about 1.5 teaspoons of regular butter or 1 tablespoon of any of the light or whipped varieties of butter or margarine). The most important thing of all, especially with weight loss, is to pay attention to how much you use! Moderation is key!